Cre8ive Challenge is an Awesome Arts initiative designed to bring young people and local artists together. Participating groups engage in an open-ended, process-based exploration of identity by examining the significant and distinctive features of their local community and environment. Groups are organised through schools, youth and arts centres. Each year Cre8ive Challenge is focused on a different project. In 2003 the project came in 2 parts: the first, a celebration/presentation of each group’s exploration of identity; the second, the collection of significant sound samples for a collaborative project with UK sound artist, Scanner. The latter become a soundscape accompaniment for a journey through the urban environment of Perth as part of the Awesome Festival in November. A significant part of Cre8ive Challenge involves taking participants out of their comfort zones by exposing them to a range of contemporary arts strategies and processes. This can be a complex operation as it sometimes reveals major disjunctions between creative processes and the participants’ expectations, but on the whole produces highly idiosyncratic and distinctive outcomes. The focus of the groups’ final celebrations was diverse and embraced several modes of arts practice. My group was Campbell Primary, situated in a recently built area south of Perth comprised of walled estates, each with their own feature lake and landscaped entry. My group of 30 Year 6s (aged 10 to 11) decided to focus on the swampland that had previously existed in the area, with their school’s shiny elevator functioning as a symbol of development and the group’s dreams and aspirations. They opted for a walk-through installation where we would create a fictional history of characters and ghostly presences within ‘the Swamp.’ We created a sensorily saturated space through the use of digital video projections, improvised electronic sounds, kooky plants, tree cuttings, constructed creatures, rich woodchip mulch and a model skeleton with lights kindly lent by an inventive parent. The school’s celebration night was well attended and the kids threw themselves into the challenge of intimate performance with relish, creating an experience that exceeded all our expectations. The scale and success of our project was in large part due to the school’s support in terms of time and money, as well as the skill and energy of my fabulous collaborating teacher, the music specialist Wendi Horne. The approach of other group projects was diverse and included several sound-focused works. Mark Cain and Gingin District High year 5 created a soundscape of elements from around Gingin Brook: frogs, jets, rain, thunderstorms, a bird-park and interviews with locals (such as a 4th generation Gingin beekeeper who told stories of catching water rats and selling their pelts during the Depression). Students created their own instruments to play with the collected sounds. Petro Vouris and Maylands Primary (Perth) explored memory through sound and an installation, creating a horror house and a detective mystery scene complete with interrogations and a survey of the audience at the celebration. Cat Hope and St Patrick’s Primary (Katanning) created a soundscape from sounds and interviews which explored the impact of natural events such as earthquakes, floods and snow. Assisted by some local Aboriginal women, they situated the sound works in cubbies built from natural elements overlooking the river in a revered Aboriginal site named after the ear of a monster from Dream Time legend. Sohan Ariel Hayes and Mt. Lawley Primary (Perth) developed a sound project. The group sonically re-created significant events in a tour of 12 sites, with the sound experienced through headphones via a radio transmitter. Sohan also worked with Yerecoin Primary, where the group explored the cycle of life by creating a macabre funereal procession of striking characters, including a 5 metre inflatable which burst from the coffin to fly away, taking several characters with it. Other groups explored the space of their social and physical environment through mapping. Stuart Clipston’s group in Carnarvon (Carnarvon Primary, St Mary’s Star of the Sea and Burringurrah Community School) mapped their movements through town and explored the relative distance between meaningful sites according to the kids’ awareness of what is significant in their lives. These maps were displayed as part of the celebration, revealing the diversity of cultural backgrounds in the one town. Annabel Dixon and North Lake Senior College explored mapping with a year 11 group, as well as collecting objects to monochrome in blue and creating a series of photographic portraits with captioned signs. Tony Nathan and Bolgart Primary experimented with photographic processes such as photograms and documented significant sites in the cultural/physical landscape, culminating with a community portrait to celebrate the 50th anniversary of the Town Hall. Poppy van-Oorde Grainger and the Kambalda Youth House group explored the significance of the bush as a landscape of freedom. 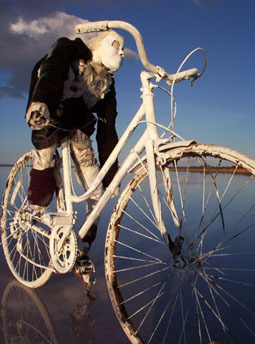 They created dummies on BMX bikes in the ‘hands up’ pose of triumph, set aflame on the reflective salt lakes in homage to the recent Antony Gormley WA salt lake art extravaganza. Poppy also worked with Lakewood Primary, exploring multiculturalism and migration by creating a mythological flock of birds as well as developing a special secret language for them. The celebration climaxed with the birds’ release via helium balloons, alongside real homing pigeons. Kerry Wilkes and Tammin Primary (years 4 to 7) used the highway as a defining element of local identity and explored it by sampling sounds, images and found elements from key sites along the road. They created a large installation in the Town Hall using road signs, tarpaulins and fertilizer tubs. Shaun Spicer and Marble Bar Primary investigated the importance of the town’s jasper deposits, echoing the textures of the stone through ‘marbling’ the walls of a historical local tin-shed church with 300 litres of paint. This was combined with a large Dream Time snake sculpture and projections of the painting, interspersed with kids improvising dancing shadows on the outside of the church. Steve Aiton and Perth Montessori decided to explore the group’s diversity via the territory of their school. They built models and employed digital technology to create an 8 minute animation in which the head of Maria Montessori functions as a house for a crazy architecture of spiral elevators and dream bedrooms containing significant objects and fictional alter-egos of the kids. Simon Perecich and Rockingham Senior High created a series of dolphins with images and symbols featured on the sides of the creatures. echoricochet, the parallel project of gathering sound samples was an enjoyable process for all the groups. Scanner has a history of working with ‘found’ samples and was interested in distinctive sounds specific to the local area. This focus gave a new awareness of each of the groups’ local environments, especially when their celebration involved a soundscape. The Katanning group were so interested in the field recording process they continued their recording project after the Challenge was completed. The soundscape collaboration was part of the Awesome Festival in central Perth. While a large, spectacular array of Chinese silk lanterns in the shape of various animals filled the main space of Forrest Chase, echoricochet was presented from an orange transit van with a little cluster of creatures that had evolved from the Challenge. The public borrowed headphones and CD players and embarked on a sound-walk through the city, guided by instructions. Perth ebbed and flowed with its usual rhythms as the soundscape evolved around the listener, offering a relaxed yet heightened awareness of the urban environment’s passing details. The layering of these far-off sounds–animals, machinery, people talking of rural experiences, children laughing and chattering–with the smooth ambient wash of gentle rhythms and pulses created an enjoyable ‘soundbath’. The presentation of echoricochet left me feeling that the more dynamic and interesting aspects of Cre8ive Challenge remained under-represented in the festival. The absence of visual documentation meant that the raw, energetic and idiosyncratic elements of young creative processes had been largely filtered from the finished product: Scanner’s soundwork was smooth and sophisticated, reflecting the refined sensibility guiding the editing process. Perhaps the final collaboration would have benefited from an accompaniment of images and explanatory material. Nevertheless, Cre8ive Challenge was a rewarding process for all involved–artists, young people and hopefully the audiences who enjoyed the final results.